The introduction today of two carbon cutting Government incentive schemes will see homes and businesses playing a key role in contributing to UK emissions reductions of at least 34% on 1990 levels by 2020 through improved energy efficiency and small-scale low-carbon electricity. The Government�s Carbon Reduction Commitment Energy Efficiency Scheme (CRC EES) for organisations and Feed in tariffs (FITs) will help to save money on fuel bills, reduce carbon emissions and generate their own low-carbon electricity. 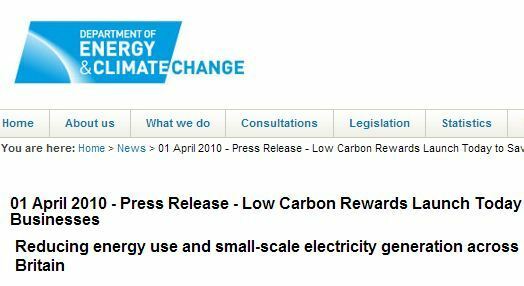 Read the Press Release [01 April 2010 - Press Release - Low Carbon Rewards Launch Today to Save Money for Homes and Businesses] for more details. Paid money for every unit of electricity they generate. Paid an extra 3 pence/kWh for every unit they don�t use that is exported to the grid. Benefitting from a reduced electricity bill where they use the electricity that they generate rather than having to buy all they need from the grid. A typical 2.5kW, well sited solar PV Installation could offer savings of �140 a year plus earnings of �900 a year.